“The apartment was entirely, was only, for her: a wall of books, both read and unread, all of them dear to her not only in themselves, their tender spines, but in the moments or periods they evoked." I didn't know what to expect going into this novel. Opinions vary widely, to say the least, but I loved it. Messud's writing, as always, is excellent - smart and incisive (though on the flip side, it's also been described as "over-stylized" and "old fashioned.") As in The Woman Upstairs, the characters are not particularly likable, but they are endlessly interesting. Messud gets the settings right, too. I love her depiction of pre-9/11 New York City and she positively nailed the bleakness of Watertown, NY, in upstate's "north country". Sometimes you just know when a book is going to work for you, and that happened here within ten pages. In addition to the wonderful writing, Messud's story drew me in immediately and then held me for the entire 400 pages. For me, this book was reminiscent of Meg Wolitzer's 2013 novel The Interestings, another personal favorite with somewhat mixed reviews. Now I can't help but wonder if Wolitzer was influenced by this novel. I think it's safe to say if you loved The Interestings, you'll love The Emperor's Children. Bottom line: This is one of the best novels I've read in a long time and my favorite book of 2016. Wow, you've made this book sound fabulous! Kathy - I thought it was pretty wonderful! I agree! I want to read it just to know more about the woman in that apartment. I had started but had to leave it, glad you rate it so highly. I might try again when the film comes out. Last I heard, Lake Bell was to direct with Jeff Bridges starring. That's was announced over a year ago. Arti - I wonder when that will be... seems like there haven't been any updates. Either way, the book was wonderful and I hope you get a chance to read it. Judith - This book is definitely a masterpiece! I got a chance to hear her speak last month... she actually read an essay, recently published in Freeman's, about her dogs. It was delightful! afterwards there was a Q&A. She was very engaging. I think I might need to read this one! Patty - Reactions are definitely mixed, but I absolutely loved this book. Give it a try! Rachel - Thank you... and I think it's a great cover, too! Great review--I like the setting and approach. Will add this to my list. It's interesting how mixed review books can really be gems--what doesn't work for some, really resonates with others. JaneGS - Thank you. I'm often drawn to mixed review books for that very reason. Absolutely loved this one! I, too, liked this book very much, as well as The Interestings. Certainly should be of interest particularly to New Yorkers. I'm currently making my way through Swing Time by Zadie Smith, which in the end I'm sure I will highly recommend. Amazing the things one can learn about life and humanity when reading any of her books. I love what I call "people stories." I have a very long list for reading next year ... and the year hasn't even begun yet! So many books, so little time. Have a great holiday with your family and I'll be looking forward to reading your early posts from Sanibel. JudyMac - And happy holidays to you, too! I've only read White Teeth by Zadie Smith and didn't like it as much as I'd hoped. Started listening to NW and gave up... that would probably have been better in print. I want to give Swing Time a try. The blurb is appealing and your recommendation makes it even more so! I've read both White Teeth and On Beauty. Liked both, but probably OB more so, simply because I read it more recently and remember more about it. Started reading her book of essays and couldn't get into it. I will say this, her books do not always grab you right up front, and it may take a while to get into the story. Have a Merry one! JudyMac - Once you finish Swing Time, I'll ask for your recommendation about whether to try that or On Beauty in 2017. I haven't read The Interestings but I did read Wolitzer's The Uncoupling, which I liked. This book (Messaud's) does have people on both fences so it's not really been a book on my radar. I think this will be a book I read by chance (because I just ran into it and I got curious etc) but I'm glad to read that you liked it. Athira - I hope the book makes it way to you at some point. I loved it! Oh nice, it's great when you come upon a Favorite Book. I've been to Watertown, and Clayton and Sackets Harbor too. We sailed from the Canadian side one summer, ha. How far are you from there? I have not tried Messud or Wolitzer yet. Susan - I'm about an hour and a half from Watertown... it's much more pleasant during sailing season ;-) Messud is now a favorite author, and I'm looking forward to more Wolitzer, too! This one is new to me but sounds like a great read. I'll have to add this one to my wishlist. Jennifer - People seem to either love or hate this one... hope you end up on the love side! Care - Hmm, strange... maybe it was another book? Not surprised if you didn't like it though. I don;t think I've ever seen such mixed reactions among bloggers. This is a book that I've looked at many times, but always passed over. After reading your review, I think I need to reconsider. 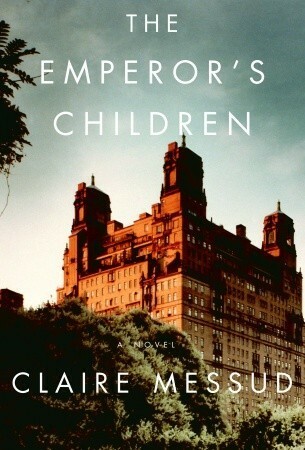 The Interestings is one of my favorite books, so with The Emperor's Children having similarities I think I'd like it! Hope your holidays are lovely! I personally love unlikeable characters as long as the writer is crafty enough to get me to understand them. Characters who are not like myself are often the ones that I learn the most from.